Aluminum is a lightweight, highly conductive, reflective and non-toxic metal that can be easily machined. The metal's durability and numerous advantageous properties make it an ideal material for many industrial applications. Aluminum compounds were used by ancient Egyptians as dyes, cosmetics, and medicines, but it was not until 5000 years later that humans discovered how to smelt pure metallic aluminum. Not surprisingly, the development of methods to produce aluminum metal coincided with the advent of electricity in the 19th century, as aluminum smelting requires significant amounts of electricity. A major breakthrough in aluminum production came in 1886 when Charles Martin Hall discovered that aluminum could be produced using electrolytic reduction. Until that time, aluminum had been rarer and more expensive than gold. However, within two years of Hall's discovery, aluminum companies were being established in Europe and America. During the 20th century, aluminum demand grew substantially, particularly in the transportation and packaging industries. Although production techniques have not changed substantially, they have become notably more efficient. Over the past 100 years, the amount of energy consumed to produce one unit of aluminum has decreased by 70%. Production of aluminum from ore is dependent upon aluminum oxide (Al2O3), which is extracted from bauxite ore. Bauxite normally contains 30-60% aluminum oxide (commonly referred to as alumina) and is regularly found near the earth's surface. This process can be separated into two parts; (1) the extraction of alumina from bauxite, and (2), the smelting of aluminum metal from alumina. Separation of alumina in normally done using what is known as the Bayer Process. This involves crushing the bauxite into a powder, mixing it with water to make a slurry, heating and adding caustic soda (NaOH). The caustic soda dissolves alumina, which allows it to pass through filters, leaving impurities behind. The aluminate solution is then drained into precipitator tanks where particles of aluminum hydroxide are added as 'seed'. Agitation and cooling result in aluminum hydroxide precipitating onto the seed material, which is then heated and dried to produce alumina. Electrolytic cells are used to smelt aluminum from alumina in the process discovered by Charles Martin Hall. Alumina fed into the cells is dissolved in a fluorinated bath of molten cryolite at 1742F° (950C°). A direct current of anywhere from 10,000-300,000A is sent from the carbon anodes in the cell through the mixture to a cathode shell. This electrical current breaks down the alumina into aluminum and oxygen. The oxygen reacts with the carbon to produce carbon dioxide, while the aluminum is attracted to the carbon cathode cell lining. The aluminum can then be collected and taken to furnaces where recyclable aluminum material can be added. About one-third of all aluminum produced today comes from recycled material. 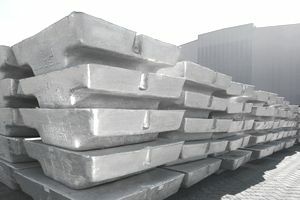 According to the US Geological Survey, the largest aluminum producing countries in 2010 were China, Russia, and Canada. Aluminum's applications are too numerous to list, and because of the metal's special properties researchers are finding new applications on a regular basis. Generally speaking, aluminum and its many alloys are used in three major industries; transportation, packaging, and construction. Aluminum, in a variety of forms and alloys, is critical to the structural components (frames and bodies) of aircraft, automobiles, trains, and boats. As much as 70% of some commercial aircraft consist of aluminum alloys (measured by weight). Whether the part requires stress or corrosion resistance, or tolerance to high temperatures, the type of alloy used is dependent upon the requirements of each component part. About 20% of all aluminum produced is used in packaging materials. Aluminum foil is a suitable packaging material for food because of it is non-toxic, whereas it is also a suitable sealant for chemical products because of its low reactivity and is impermeable to light, water, and oxygen. In the US alone, about 100 billion aluminum cans are shipped every year. Over half of these are eventually recycled. Because of its durability and resistance to corrosion, about 15% of aluminum produced each year is used in construction applications. This includes windows and door frames, roofing, siding, and structural framing, as well as gutters, shutters and garage doors. Aluminum's electrical conductivity also allows it to be employed in long distance conductor lines. Reinforced with steel, aluminum alloys are more cost-efficient than copper and reduce sagging due to their light weight. Other applications for aluminum include shells and heat sinks for consumer electronics, street lighting poles, oil rig top-structures, aluminum coated windows, cooking utensils, baseball bats, and reflective safety devices. Street, Arthur. & Alexander, W. O. 1944. Metals in the Service of Man. 11th Edition (1998).